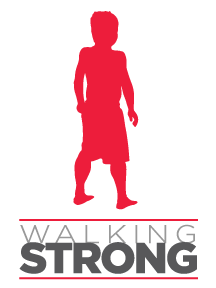 When Walking Strong began, we knew that building awareness for Duchenne was imperative. We felt strongly that athletes would be a natural and impactful fit to get behind our cause, but didn’t have any idea how we were going to make it happen. After all, we didn’t personally know any professional athletes. When we began to plan our 2nd Annual event, we decided to call it “A Night Of Strength” – focusing on the word “Strength.” We wanted to create a video piece to show athletes and their strong muscles are giving Duchenne kids and families their strength. We recruited our talented friend, Director- Keegan Wilcox – and with his fantastic vision, the I AM STRONG video was born. This piece would exemplify the different meanings of the word “Strength.” “Strength” to an athlete means: using their strong muscles to be at the top of their sport, but the “strength” of a Duchenne boy, exemplifies their will and determination to stay strong, not letting Duchenne defeat him. The piece would end with a powerful epiphany by an athlete that truly the stamina of a Duchenne boy is stronger, and he would look at the camera and tell the world “They, are Stronger.” The treatment for the video was solid, but now we had to find the athletes to participate. We put our feelers out in a lot of different contacts, and hoped for the best. We started with our friend Matt Willig, a former USC Trojan and NFL player, and as we shot him running up a mountaintop one morning, I stood on that hill and thought to myself, what are we doing? How did we get here? And the bigger question was, how is this video going to come together? The mountain didn’t answer back, but I had a sense of calm that defied reality. Then, one afternoon at a kids soccer tournament in Newport Beach, Alexander’s Godmother, Laurie Anast, seized an opportunity to connect with one of the biggest superstar athletes in the world. She handed him a short but powerful note telling him about her Godson and his battle with a rare disease called, Duchenne. Three hours later, his office called and asked how they could help. The words Divine Connection never seemed so real. Three weeks later, we were in his office shooting the video. We never expected him to give us his unwavering attention, his precious time and his compassion, but he did. From that meeting, the floodgates opened. We had athletes coming forward to participate with such ease, that it was truly was a miracle. Not even our wildest imaginations could have predicted the caliber of athletes, nor the empathy they showed. One after the next, they agreed to partake in our cause without any limitations or questions. We were caught up in a whirlwind over a week of meeting them in their athletic environments and shooting them give their heartfelt and compassionate messages to the public. A Night of Strength Gala, was a moving and powerful evening that opened with a message from Oscar De La Hoya asking everyone in the room to join him in “giving strength” that evening. Almost 300 people enjoyed live music, fabulous food and craft cocktails, as well as listening to powerful messages from both Duchenne parents and UCLA scientists, but also filmed messages from Oscar De La Hoya and Kobe Bryant. The highlight of the evening is when we surprised a local struggling, Duchenne family, with a handicap accessible van for their 18 year old son, Jayleen. That night changed their lives forever. The silent auction was a treasure trove of priceless athletic memorabilia including a signed shoe from Kobe Bryant, a signed shoe from Julius Randle, a signed Basketball from Meta World Peace, and a signed glove from Oscar De La Hoya. The live auction brought in almost $100,000 alone. After the dinner and silent auction, guests strolled over to the casino room and were entertained with DJ music and craft cocktails. The energy and support from the entire community made our spirits soar and gave us an undeniable strength. Our prayers and wishes were granted, and the athletic world now knows Duchenne. Our prayers were answered, and we look forward to how their muscles are to continue to help us and our boys keep walking strong.